Escape with attractions near and far. From mild delights to wild thrills, attractions and rides abound at one of the sweetest parks in the Northeast. Little ones cherish the Dry Gulch Railroad and the Balloon Flite, while older kids enjoy adventurous rides like the Comet and the Sidewinder. There are rides for children, families, thrill seekers and folk who are less daring. Worried about the heat? The Boardwalk at Hersheypark offers nine water attractions for cooling off. The fun doesn’t stop there— guests are sure to run into Hershey characters and strolling bands throughout the park. All summer long, enjoy live entertainment from jukebox heroes, comedy performers and tribute bands. Meal plans for groups and special event coordination are available for making family reunions, birthdays and anniversaries spectacular. Step into a world where flowers, trees and bushes rule. Set up by the M.S. Hershey Foundation, Hershey Gardens provides learning opportunities and unforgettable experiences with fantastic garden views in the backdrop. These include the Historic Hershey Rose Garden, which features a brilliant assortment of 5,600 roses representing 275 varieties of the blossom. Among the many theme gardens is the enchanting Children’s Garden. Hershey’s Kisses-shaped misters greet guests with a fine spray of water, before visitors take the paths through 32 areas with new things to discover at every turn. The entire family is sure to get lost in the lush splendor. Believed to be a refuge during inclement weather for Susquehannock Indians until the 1670s, the Indian Echos Caverns went nearly untouched until 1929 when John Bieber sought to open the caverns to the public. Since his massive commercialization project to make the area more accessible, hundreds of thousands of people continue to visit the limestone caves each year. They learn about the cavern formation and animal life that thrives there. Outside the caves, the Gem Mill Junction enables guests to try their luck searching for chunks of amethyst, jasper, calcite, agate and other gems. The knowledgeable staff and breathtaking surroundings thrust visitors into nature and transport them back in history. Through exhibits, interactive experiences, a museum shop and Cafe Zooka, the history of Hershey’s chocolate comes alive. Learn how at age 26, Milton Snavely Hershey was nearly broke but his unwavering confidence led to huge success and inspired a legacy. The Chocolate Lab invites visitors to get their hands in the chocolate with projects like building a chocolate bar and making s’mores treats. Another treat this summer is the showing of the 133-year-old Apostolic Clock the first weekend of every month. This clock that took 11 years to build displays several mechanical figures performing for onlookers. The home of the influential Pemberton family that is now known as the Bolton Farm or Bolton Mansion has become one of the most significant dwellings in Pennsylvania. While visiting the lush area of Bucks County, families are encouraged to grasp the history and hauntings of the home. Discover the generations of people who lived in the Bolton Mansion and the few spirits who have stayed behind. Run by appointment, tours highlight the area and how one family became so interwoven in the community that nearly 300 years later the effect lingers. A large portion of the 339 acres that make up the state park were handed over to the commonwealth of Pennsylvania upon the death of a Colonial secretary to state founder William Penn in 1956. Today, the lush landscape that takes its name from the Neshaminy Creek offers picnic pavilions, swimming pools, fishing opportunities, nature trails and views of the Delaware River marshes. The forest is also part of the Go Green program supported by the Philadelphia Eagles, which has already planted hundreds of trees and shrubs and increased fans’ interest in natural conservation. Come play with all of your family’s favorite Sesame Street characters. Tykes can become king of Cookie Mountain, join Gonzo on the Vapor Trail and get lost in Elmo’s World. 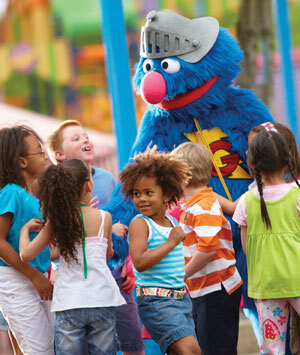 Sesame Place offers rides and games to stimulate every guest’s imagination. In addition to the Dry Fun, guests can streak and slide their way to Wet Fun in the park’s full water park. Speed down Bert and Ernie’s Slip and Slide and play in the Count’s Splash Castle. When all the fun has been had or your clan simply needs a break, take a seat to enjoy the countless shows staged daily in the park. The characters and learning that many generations grew up loving are brought to new life in this fantasy world. New this year are crowd-pleasing Sesame Place additions including the Neighborhood Street Party that turns learning about letters, numbers and friendship into a musical sensation. Complete with beverages, snacks, flowers and more, More Than a Cab provides exceptional airport transfer service and tours that showcase St. Lucia’s beaches, blue skies and tropical foliage. Whether you’re arriving on the island by cruise ship or staying at a hotel or resort, More Than a Cab accommodates families’ needs and time restrictions. As cruise guests generally have a short amount of time on the island, the company has a quick list of picturesque sites it highlights, such as the Botanical Gardens, the Diamond Waterfalls and the volcanic plugs known as the Pitons. For land-based visitors, longer tours specific to a region, an historic estate or a natural phenomenon are available, with pickup and drop-off service to and from hotels and resorts. Requests for tours and excursions are also welcome. The great thing about getting away is getting to see something different. Rainforest Adventures allows vacationers to experience the rainforests of St. Lucia and Jamaica from a new and exciting perspective. In St. Lucia, ride the relaxing rainforest aerial tram, fly on the zip lines, take a bird tour and hike the trails. The location of Rainforest Adventures in St. Lucia is set on the exclusive entry to the rainforest canopy, which accounts for 65 percent of the life forms in the rainforest. In Jamaica, view the mountainside while aboard a Jamaica bobsled, fly through the tops of the rainforest on a zip line and find yourself eye to eye with wildlife on the tranopy ride. Atop Mystic Mountain, enjoy delicious eats, shopping and insight into the island’s culture, history and conservation efforts. Guests are then invited to take a dip in the infinity-edge pool and slide down the water slide. New in 2011 is the opening of the Dolphin Cove in Negril. The 20-acre property is the largest natural dolphin lagoon in the world that permits guests to touch or swim with dolphins. Sure to make the lagoon a hot spot is the upcoming addition of the Snorkeling with Stingrays experience. At the original Ocho Rios location, which is adjacent to the spectacular Dunn’s River Falls, there is something for each member of the family. Spend the day being captain of your own mini boat to explore the coast or see the wonders of the ocean through a glass-bottom kayak. For shy sea explorers, encounter programs allow vacationers to get close but not too close to dolphins. For the adventurous are swimming opportunities and a Swim, Hold and Feed the Sharks program. When you’re ready to get out of the ocean, watch the hilarious Shark Show and interact with exotic birds, snakes and iguanas on the Jungle Trail walk. Many movies and shows have portrayed horseback riders on beautiful steeds in crystal blue shallow waters along white sand beaches. Enjoy just that with your family during a horse or pony ride along the quiet dirt roads and trails from the Provo Ponies facility to the secluded Long Bay Beach. While children younger than age 6 must have previous riding experience, those ages 6 through 17 are welcome to ride with the provided safety gear. Groups are briefed on riding safety and receive an equipment check and basic riding instruction. Private rides are available, as well. Provo Ponies takes into account every riders’ ability to ensure smooth riding for all. A former cotton plantation set against the backdrop of modern Providenciales, Cheshire Hall is comprised of 200-year-old ruins. A British citizen named Wade Stubbs received an 860-acre grant on which he built Bellefield Plantation. His brother Thomas came to the island to make his fortune, and renamed the property Cheshire Hall after their hometown in England. In 1810, Thomas sold the plantation back to Wade. A cornerstone inscribed with “W. Stubbs 1810” still stands to mark the transaction. Around the stone on the breezy hilltop stand the remains of the plantation’s Great House and a number of other buildings along with structures that would have held instruments of the cotton industry, including a cotton gin and cotton press. The area is now overgrown with the lush plant life of the region that attracts butterflies, birds and lizards— and of course the flocks of families that visit Cheshire Hall while in Turks & Caicos.